I have recently started climbing mountains; I don't know how I got started again, I suppose it was a trip up Glacier Peak in 1998 suggested by my friend Nick that re-kindled the interest. That trip was an experiment for me, to determine whether my recovery from an ACL operation was successful. The trip was great, and since moving to Seattle I've started climbing more, especially on the volcanoes. 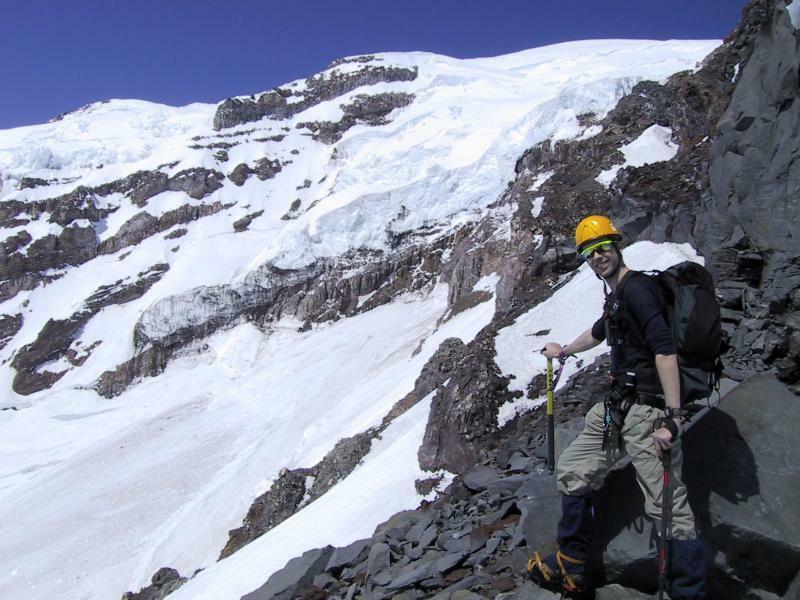 Here are some photos from trips to the Cascade volcanoes. I've also been winter climbing in Scotland recently; my first trip up Ben Nevis was a nice ice and snow climb up Ledge Route on the north face, arriving at the top in near-whiteout conditions. Jeff, Nick, and I climbed Glacier Peak in July 1998. We climbed over a long weekend; the walk in and out of the Glacier Peak wilderness was pretty hard going, the climb itself was not very technical. These photographs are copyright (C) Nick Lowry, 2000. There are more on his web page. A fingernail moon rises over Glacier Peak; we made an alpine start to arrive at the top about dawn, and be off the glacier before the afternoon warmth. This picture was taken as the first light of dawn arrived (31K JPEG). Jeff and myself on the top; Jeff looks like he's practicing yoga (40K JPEG). Nick and myself rest from the weight of our packs on the walk back (48K JPEG). Part of my preparation for climbing Mt. 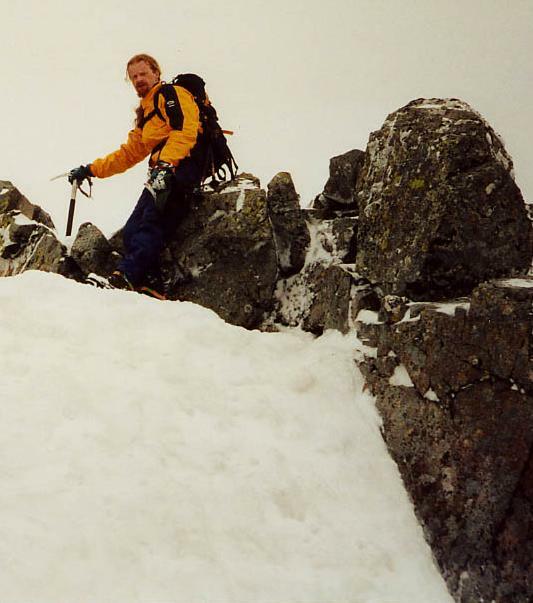 Rainier was to go ice-climbing with my brother Peter on Ben Nevis, the highest mountain in Scotland. Even though it is only 4,408 feet high, the weather can change suddenly, and there is classic ice and snow climbing to be had in winter. We went up Ledge Route on the North side of the mountain while I was visiting on a business trip. These photographs are copyright (c) 2000 Peter Duggan. Myself resting halfway up Ledge Route in a whiteout (41K JPEG). At the top of Ben Nevis; we walked only feet past the shelter at the top several times before finding it. My ice-axe cord and beard are frozen up. On the way down, we had to take compass bearings and distance measurements to get down safely (38K JPEG). 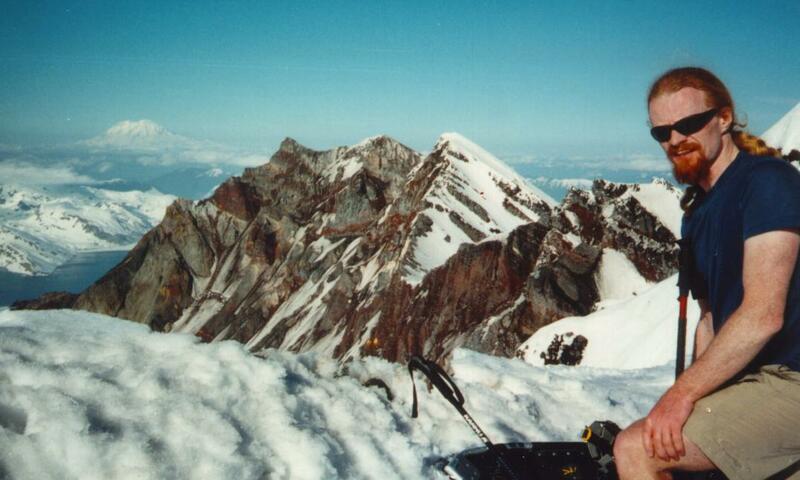 Nick and I climbed Mount St. Helens in the spring of 2000. Jeff and Chris gave up at around 5000 feet while we slogged on to the top in deep, soft snow, on an unseasonably warm day. As the photos show, it was worth it for the view. These photographs are copyright (C) Nick Lowry, 2000. Myself slogging up the mountain. I started using trekking poles for climbing and hiking on the advice of my orthopaedic doctor, and find that they help reduce the stress in the knees a lot (38K JPEG). At the top of Mt. St. Helens, overlooking the crater. The view was dramatic (86K JPEG). 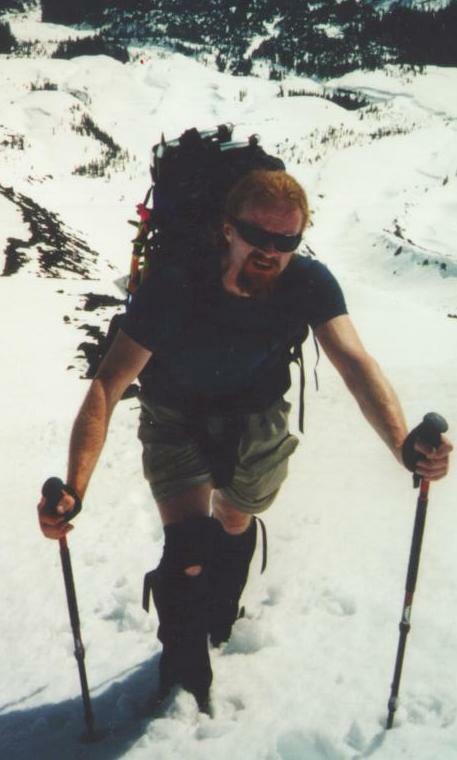 Nick and I took an exploratory trip to Camp Muir in early April of 2000, to determine whether we could ski up and down, and carry enough climbing gear. The answer was yes, but we would be faster and less tired not using the skis. We didn't attempt to climb to the summit, but did take an exploratory climb to the BeeHive at 11,000 feet after overnighting at Camp Muir (10,188 feet). These photographs are copyright (C) Angus Duggan, 2000. A broad view from the Kautz glacier (left), Nisqually ice-cliff (centre), and Gibraltar Rock, with a part of Cathedral Rock visible (right) (41K JPEG). 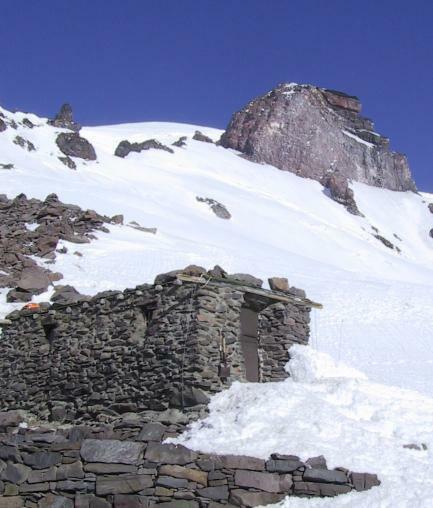 The guide-hut at Camp Muir, looking up to the ridge to the BeeHive (the prominent spire) to Gibraltar Rock (35K JPEG). 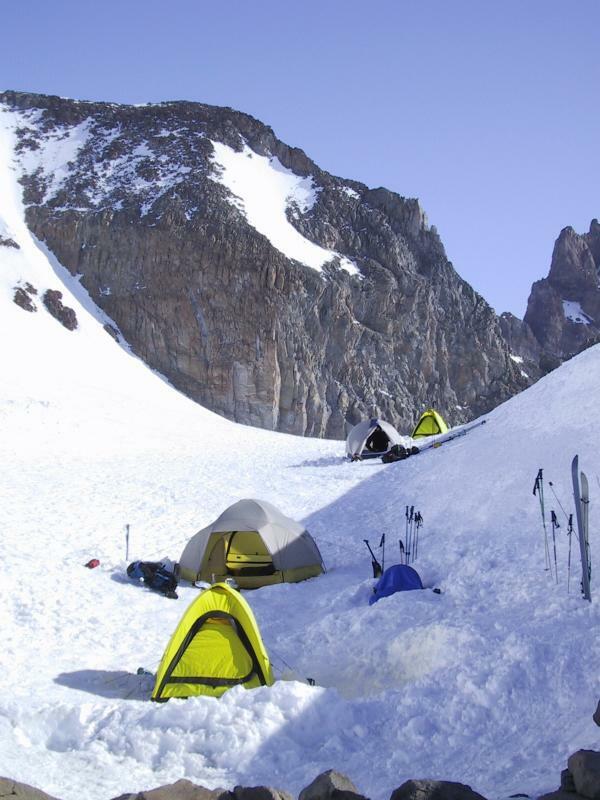 Tents at Camp Muir, looking across the Cowlitz glacier to the lower Cathedral Rocks (69K JPEG). Nick views the Nisqually ice cliff from the BeeHive (83K JPEG). 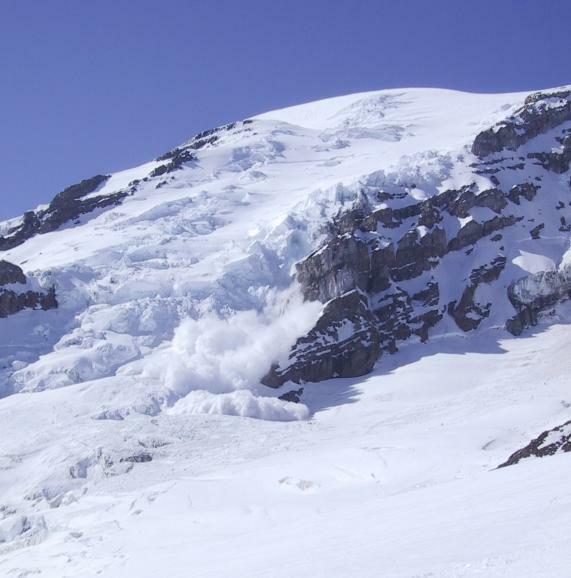 A large ice avalanche on the Nisqually glacier (40K JPEG). After another attempt that was thwarted by the weather, we finally managed to climb Mt. Rainier at the end of June 2000. 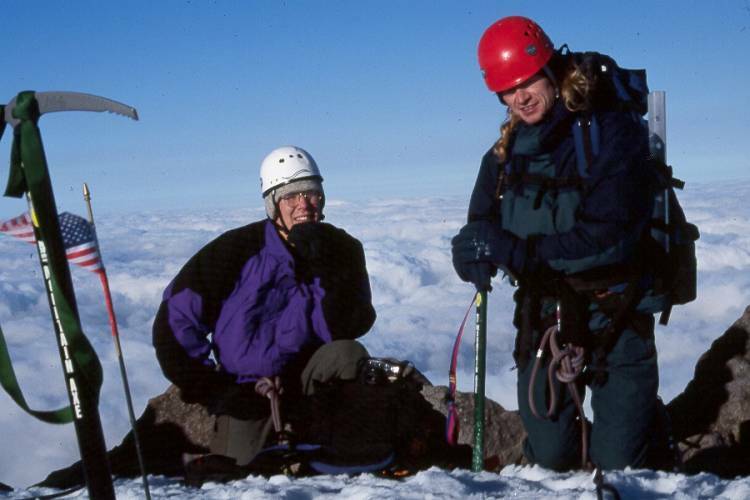 Since then, I've summitted Rainier twice more, one with a group from my friend Jolanta's work, and once with my brother Peter. Here's a 360 degree long-focus panorama taken with my Canon PowerShot Elph digital camera, and reassembled using the photostitch software that came with it. This photograph is copyright (C) Angus Duggan, 2000. A panorama from Mt. Si. The Olympic mountains are in the distance, with Seattle almost visible in front (it is on the full-size image, which is rather too large for the web page), and Mt. Baker and Mt. Rainier are visible panning around. Glacier Peak may just be visible, peeking out from behind the close hills (190K JPEG). This trip was Jeff Adams' bachelor party. Nick, Nathan and I arrived at Mt. Adams via Merrill Lake, where we stopped for some fishing on Friday night. Jeff, David, and Courtney arrived late, and we all convoyed up the access road to the South Spur trailhead. Nick and I would have preferred to have taken a slightly more interesting route, but it was Jeff's party, and he had brought skis to come down. The South Spur route is very popular, and this weekend was no exception. Somewhere around 300 people had registered at the ranger station that weekend, so it wasn't going to be a wilderness experience. We slogged up the trail and snowfields, eventually stopping on the ridge at the left of the ``lunch-counter'', a flat area at about 9,000 feet commonly used for camp sites. The camp sites were great, previous climbers had cleared areas on the cleaver and built low walls to help shelter from the winds. Nick, Nathan and I did some rope-work for practice, and tried out the snow-blades (mini skis about 2.5 feet long) that I had brought. Nick and I wanted a daybreak start, so we got up about half past 4 in the morning and started the stove. Nathan's tent had collapsed during the night, so he had just wrapped it round him and slept on the ground. After a lot of waiting and faffing trying to get Jeff up and going, Nick, Nathan and I headed off up the couloir above us. After about half an hour or and hour we saw Jeff, David and Courtney leave and start up the main route. The conditions were fine, and the climbing non-technical (I lugged a rope all the way up and down again without using it). On reaching the false summit at 11,600 feet, the wind was strong, and we put on extra thermal layers. The real summit is quite some distance beyond the false summit, rising another 800 feet above a plateau. Starting up again, we slowly trudged all the way up to the summit, the altitude making it harder going. Nick, Nathan and I spent a considerable time at the 12,400 foot summit, waiting for Jeff, David and Courtney, who turned up about an hour later. They had left their skis at the false summit for the ski down. The visibility was awesome that day; we could see all the way down the volcano chain to Mt. Bachelor, and up to the Olympics, about 150 miles in each direction. After performing a bizarre ceremony with a cherry, I tried descending the top section on the snow-blades, embarrassing myself by falling over a lot. The snow conditions were a bit too icy to have any control. I decided to join Nick in glissading down the rest of the summit section, and discovered that snow-blades are not good to sit on either; I ended up with many bruises on my backside. I lost a water bottle that had not been properly secured on the summit glissade. The glissade or ski down the South Spur are the only good reasons to use that route; Nick made it down about 3,000 feet in twenty minutes to our camp. I was a bit slower because I was trying to ski properly on the snow blades, and was making turns rather than heading straight down. After making more tea and packing up camp, we headed down the main slope, Nick and I glissading where possible, and Nathan walking down. Jeff, David and Courtney set off skiing down ahead of us. Nick and I made the mistake of following the fall line, and after a great glissade caught up Jeff, David and Courtney, who had also gone the wrong way. We eventually had to traverse around the mountain to regain the trail, arriving back at the trailhead after Nathan. I hurt a thigh in a stupid little slide down a snow slope on this last section, landing badly at the bottom. Two weekends, two volcanos! 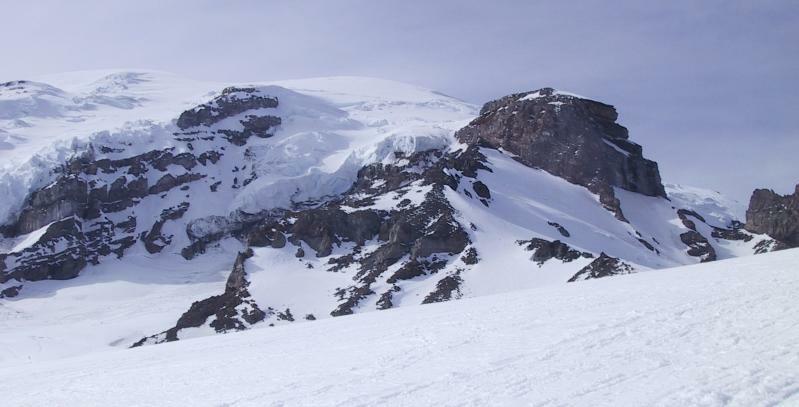 Nick and I finally climbed Mount Baker (10,781 feet), the northerlymost volcano in the U.S. Cascade Mountain chain the weekend after climbing Mount Adams. We had tried twice before in the year, the first time at the end of April and the second time in May. Both times we had been turned back by weather. On the April trip, the snow was not melted out to allow us access to the Boulder Ridge trailhead. We had to park a mile before the trailhead, and by the time we had reached the trailhead it was dark. We camped at the trailhead, and then set off early. The trail was hard to follow under the snow, and we eventually lost it. After several hours of bushwacking in sunny, hot weather, and sinking knee and thigh deep into soft snow, we reached the top of the ridge, some distance below the tree-line. The going did not get any better, and having spent about six hours getting to the point we should have got to in two, we stopped for lunch. A spectacular thunderstorm brewed up at the other side of the valley, and we decided that prudence being the better part of valour, we would retreat off the ridge. My boots were also wet inside because my old gaiters had failed, so we decided not to stay overnight, and re-traced our steps back to the car and Seattle. Our second attempt was also on Boulder Ridge, in mid May. This time we found the right trail, and finally gained the ridge via a rotten old fixed rope. We camped overnight on the ridge, planning for an early start, but were foiled again. On opening the tent door in the morning, we discovered we were in the middle of a cloud. We had already determined we wanted decent visibility for an unknown route, so we went back to bed to wait for the clouds to lift. The clouds did not lift fully, so we made our way down out of the mist and retreated once again to Seattle, this time stopping to go fishing on the way. I hadn't slept too well that night, because as we went to bed, a flash of lightning lit up the sky. The thunder wasn't audible, but it was somewhat spooky to be lying in a thin tent on a ridge, wondering if the next lightning flash would be closer. The third and successful attempt on the Boulder Ridge/Cleaver route was the weekend after climbing Mt. Adams. I had suffered a thigh strain trying to ski down on that trip, so had my thigh bandaged for support. Nick and I left Seattle on Friday afternoon, arriving at the trailhead with an hour or so of light. We had a short hike up to the Alpine meadow that night, and found a nice camping spot where we could get water and set up a rope to hang food out of reach of animals. We made a daybreak start, and pushed up the ridge and onto the cleaver by lunchtime, finally stopping to camp high on the cleaver at about 8,000 feet. The weather was beautiful and sunny, but the freezing levels were high, so the snow was a bit soft. We roped up for a small crevasse field at the bottom of the cleaver, and brought out the crampons near the top of the cleaver. Our high camp was on the cleaver, on a cleared spot just above a gendarme, with fanstastic views of the crevassing on the Boulder Glacier and the Park ice-fall. The summit and route was in good view, so we looked at our route for the morning, planning a daybreak start. The wind increased at nightfall, and the sulphurous fumes from the nearby crater occasionally were a bit of a bother, but overall it was a great spot. The wind was still blowing in the morning, but it was warm enough. We found ourselves looking out over an undercast of low clouds. Just as we were preparing to climb, another party surprised us by climbing up past our camp; we were the only two climbing parties on that route on that day, which was a nice change from the melee of the previous week. Nick and I followed their footsteps for a few hundred feet, and then diverted for a more direct route up the cleaver. It turned out to be somewhat harder than the normal route, with a bergshrund to negotiate, and some rather flaky rock on the cleaver. Sunrise brought a beautiful pink glow to the mountains. Over the top of the cleaver, we ascended a 40 to 45 degree snow slope, joining the other route just before the summit. At the summit, we found there were many other climbing parties converging from the other climbing routes. The wind was stronger at the summit, and after a short stop for photos, food, and a weird ritual involving a cherry, we followed the other Boulder Cleaver party down. The high freezing level was weakening the snow, and we were glad to be off the steep sections near the summit; our boots were causing some small surface avalanches, and there were a few places where icy layers were obvious a few inches underneath the surface, causing a little worry over slab avalanches. At the camp, we made tea, packed up, and watched some more small avalanches pour off the summit headwall. The route down beside the cleaver was in good shape for glissading, so we slid as much as possible while staying roped up, stopping only for the crevasse field at the bottom of the cleaver. The warm temperatures had opened out some more crevasses, but it was still easy routefinding. We could have done with placing a few more wands on the way up. We stopped at the top of the ridge to dry out and eat lunch, before abseiling down and hiking out along the trail. The low clouds had burned off by this time, and we were down to our last drops of water when we reached the car. The water we had left in the car was very hot, but that didn't stop us from drinking as much as possible immediately. As well as the topo maps and guide book, we used Google Earth to try to plan the route. I flew a plane down to Sisters Airport (6K5), where Nick and his wife Amanda met me. Amanda came with us up to our campsite for the first night, and we planned that she would meet us coming off South Sister two days later. (I'll write up the rest of this later, but suffice to say, we lost a critical part of the stove at a tea-break on the way up, and wasted a lot of time looking for it, then we took a little diversion on the way up Middle Sister, then realised that the route up the north side of South Sister was a lot more serious than we had been led to believe.) The route down to the col from Middle Sister was also nasty with a pack on, it was large loose boulders and scree; at one point I put my foot on a boulder about my own weight, and it rolled over, nearly trapping my leg. We bailed out of the carry-over, and took a different route out. Fortunately the miracles of modern technology (cellphones) enabled us to leave a message for Amanda, so she was waiting at the right place to pick us up. My brother Peter came over to climb with me in the summer of 2006, and we started off with a warm-up climb of the Brothers. These are two prominent peaks on the east side of the Olympic Mountains which form a distinctive part of the skyline seen from Seattle. This was another trip that didn't quite work out as planned. Peter has written up his trip report, I'll get around to writing something about this climb sometime. 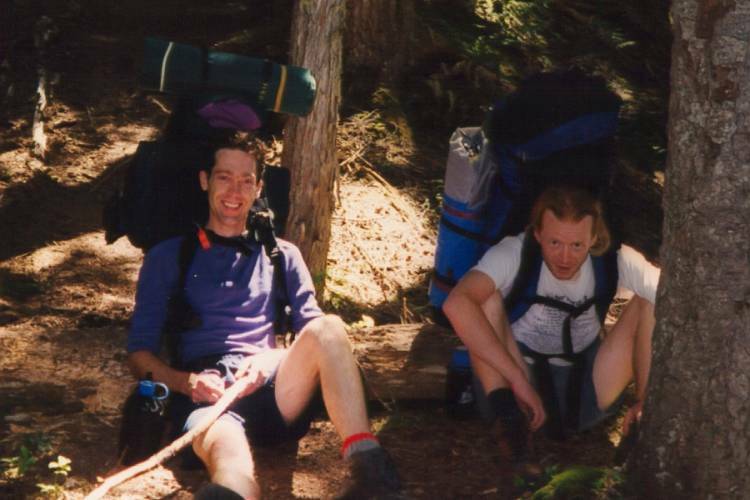 After the trip up Brothers, Peter and I tackled Mount Hood, whilst waiting for a weather window for Mount Rainier. Peter and I were lucky in getting both the weather and the recovery window to be able to tackle Rainier as well as the other climbs in the same trip. The climb up and down the Kautz Icefall was the most technically challenging I've undertaken, and when we reached the top of the icefall at 11,000 feet, I was just about all in. 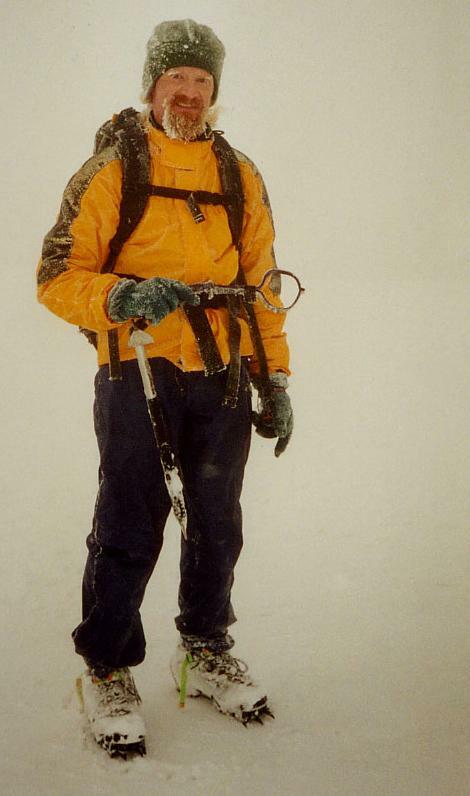 I knew how much Peter wanted to reach the top, so I let him drag me pretty much all of the way up, with me leading only a little bit while probing snow bridges across a huge crevasse. I'll write up my perspective on it sometime.